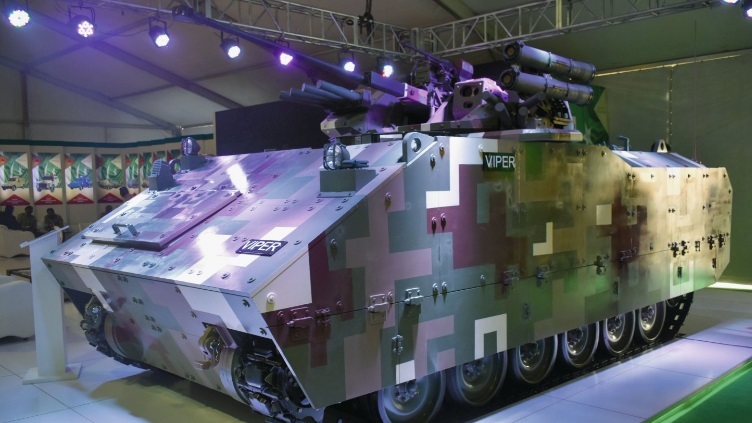 Pakistani armour manufacturer Heavy Industries Taxila (HIT) unveiled its latest infantry fighting vehicle (IFV), the Viper, at the IDEAS 2018 international defence exhibition, held in Karachi, Pakistan, between 27-30 November. The Viper is based on a lengthened chassis derived from the M113 tracked armoured personnel carrier (APC) and has six road wheels on each side compared to the M113's five. Unlike the M113, the IFV is additionally protected by appliqué armour. "The Viper weighs some 16 tonnes and is protected in accordance with Level IV STANAG 4569 [all-round protection against 14.5 mm armour-piercing bullets fired at a distance of 200 m]," a source from HTI told Jane's at IDEAS 2018. The Viper has retained the internal layout of the M113 APC, with the powerpack mounted in the front right part of the hull. The vehicle transports up to 13 soldiers (including a crew of three) in anti-blast seats without neck protection. However, the hull lacks a spall liner or any additional anti-fragmentation protection for the crew and dismounts. The vehicle's troop compartment is fitted with an exit ramp. The prototype of the Viper has been fitted with a modified Turra 30 remotely controlled weapon station (RCWS) armed with a Slovak-made Shipunov 2A42 30 mm automatic cannon, Kalashnikov PKT 7.62 mm medium machine gun (MG), two ready-to-use 9M113 Konkurs (AT-6 'Spandrel') anti-tank guided missiles and smoke dischargers. The Konkurs missiles and Kalashnikov MG, the source noted, were supplied by East European NATO member states. The RCWS's sensor suite incorporates a daylight TV camera, infrared sight, and laser rangefinder. The commander's workstation can additionally be fitted with a panoramic sight. I'm a fan of the M-113, but there comes a time when enough is enough. That vehicle served us well but it's time has long passed. Like the Model T, it will live in history but should only be seen in museums and car shows...like the M-113 should!